Has anybody opened theirs yet? Edited by AlsonFam, 16 November 2018 - 09:26 PM. Enforcer I get coz of reverting to original effects. The Etran puzzled me. Gonna wait for Remix if there's anything good. 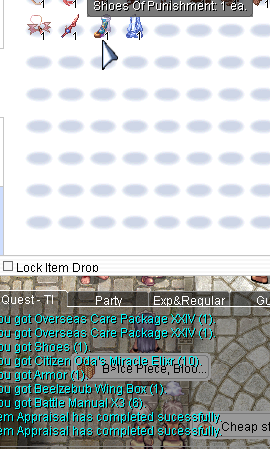 Had 2100 KP left...got imperial shoes on last...hell yes! I am done! First 40 boxes didn't get me any the Leviathan Mufflers, Shoes Of Punishment, or Imperial Boots so I used the rest of my KP and at least got two Leviathan Mufflers. Frustrating box in general as it was originally five items I really wanted then the best two were removed and replaced with much less helpful (for me) items which ended up being the only rares I got. All in all not super happy on this but hopefully boxter can clean up the junk that came with the box and fix the shoe situation. Opened a few boxes hoping to obtain that water-proof garment, didnt get one but instead I ended up with an Imperial Boots and Enforcer Shoes, not too bad if you ask me. Ofcourse, after people complain about the King Circlet and the Nature Dress, who else would buy this garbage OCP? 5 Boxes, the shoes and the vicious thing. I love it, when you always open 20 boxes [6000 KP] per new released ocp. It's very satisfying to watch. Won't be buying this one. Though I would have with the removed items. this enforcer shoes in this box was really troll.